Domain Name System Security Extensions (DNSSEC) is a suite of extensions that add security to the DNS protocol. With DNSSEC, non-authoritative DNS servers are able to validate the responses they receive when they query other DNS servers. In addition, DNS client computers running Windows® 7 or later can be configured to require this validation be performed. This guide provides step-by-step instructions for deploying DNSSEC in a test lab using two server computers or, optionally, three server computers and one client computer. Software and hardware requirements are provided, as well as an overview of DNSSEC. For information and detailed procedures to deploy DNSSEC in a production environment, see DNSSEC in Windows Server 2012. Note: The concepts and procedures in this guide apply to both Windows Server 2012 and Windows Server 2012 R2. You can use either operating system in the test lab. The DNS protocol is vulnerable to attack due to an inherent lack of authentication and integrity checking of data that is exchanged between DNS servers or provided to DNS clients. DNSSEC adds security to DNS responses by providing the ability for DNS servers to validate DNS responses. With DNSSEC, resource records are accompanied by digital signatures. These digital signatures are generated when DNSSEC is applied to a DNS zone using a process called zone signing. When a resolver issues a DNS query for resource record in a signed zone, a digital signature is returned with the response so that validation can be performed. If validation is successful, this proves that the data has not been modified or tampered with in any way. DNS spoofing is a type of attack that involves impersonation of DNS server responses in order to introduce false information. In a spoofing attack, a malicious user attempts to guess that a DNS client or server has sent a DNS query and is waiting for a DNS response. A successful spoofing attack will insert a fake DNS response into the DNS server’s cache, a process known as cache poisoning. A spoofed DNS server has no way of verifying that DNS data is authentic, and will reply from its cache using the fake information. An attacker can also set the time to live (TTL) on fake DNS data to a very long interval, causing the DNS server cache to remain poisoned for many hours or days. It is also possible to send a DNS spoofing attack directly to a DNS client; however these attacks are less persistent than cache poisoning attacks. Both of these types of attacks can be prevented with DNSSEC by requiring that DNS responses are validated as authentic. See the following figure. DNSSEC uses digital signatures and cryptographic keys to validate that DNS responses are authentic. The following topics briefly discuss how these signatures are managed and validation is performed. Signatures generated with DNSSEC are contained within the DNS zone itself in the new resource records. These new resource records are called RRSIG (resource record signature) records. When a resolver issues a query for a name, the RRSIG record is returned in the response. A public cryptographic key called a DNSKEY is needed to verify the signature. The DNSKEY is retrieved by a DNS server during the validation process. When you sign a zone with DNSSEC, you are individually signing all the records contained in the zone. This makes it possible to add, modify, or delete records in the zone without re-signing the entire zone. It is only necessary to re-sign the updated records. What if a DNS query is for a record that does not exist? If the DNS server responds that no record was found, this response also needs to be validated as authentic. However, since there is no resource record, then there is no RRSIG record. The answer to this problem is the Next Secure (NSEC) record. NSEC records create a chain of links between signed resource records. To create NSEC records, the zone is sorted and NSEC records are created such that each NSEC record has a pointer to the next NSEC record. The last NSEC record points back to the first record. When a query is submitted for a nonexistent record, the DNS server returns the NSEC record prior to where the nonexistent record would have been in the order. This allows for something called authenticated denial of existence. NSEC3 is a replacement or alternative to NSEC that has the additional benefit of preventing “zone walking” which is the process of repeating NSEC queries in order to retrieve all the names in a zone. A DNS server running Windows Server® 2012 supports both NSEC and NSEC3. A zone can be signed with either NSEC or NSEC3, but not both. A trust anchor is a preconfigured public key associated with a specific zone. A validating DNS server must be configured with one or more trust anchors in order to perform validation. If the DNS server is running on a domain controller, trust anchors are stored in the forest directory partition in Active Directory Domain Services (AD DS) and can be replicated to all domain controllers in the forest. On standalone DNS servers, trust anchors are stored in a file named TrustAnchors.dns. A DNS server running Windows Server 2012 or Windows Server 2012 R2 also displays configured trust anchors in the DNS Manager console tree in the Trust Points container. You can also use Windows PowerShell or Dnscmd.exe to view trust anchors. DNSSEC key management strategy includes planning for key generation, key storage, key expiration, and key replacement. Together, key expiration and replacement in DNSSEC is called key rollover. In Windows Server 2012 and Windows Server 2012 R2, key management is made easier with simple and flexible key generation, Active Directory storage and replication, an automated key rollover. In Windows 8, Windows Server 2012, Windows 8.1, and Windows Server 2012 R2, the DNS Client service continues to be non-validating and security-aware, the same as computers running Windows 7 and Windows Server® 2008 R2. When the DNS client issues a query, it can indicate to the DNS server that it understands DNSSEC. However, the client is non-validating. When issuing queries, the DNS client relies on the local DNS server to indicate that validation was successful. If the server fails to perform validation, or reports that validation was unsuccessful, the DNS Client service can be configured to return no results. The Name Resolution Policy Table (NRPT) is a table that contains rules you can configure to specify DNS settings or special behavior for names or namespaces. The NRPT can be configured using Group Policy or by using the Windows Registry. When performing DNS name resolution, the DNS Client service checks the NRPT before sending a DNS query. If a DNS query or response matches an entry in the NRPT, it is handled according to settings in the policy. Queries and responses that do not match an NRPT entry are processed normally. You can use the NRPT to require that the DNS Client service perform DNSSEC validation of DNS responses for the namespaces that you specify. This test lab demonstrates new DNSSEC functionality in Windows Server 2012. Three server computers and one client computer are used. See the following figure. Two server computers are required to complete the test lab. Optionally, three server computers and one client computer can be used to complete additional steps in the test lab. All references to Windows Server 2012 and Windows 8 in this guide apply equally to Windows Server 2012 R2 and Windows 8.1. For a summary of updates available to the DNS Server service in Windows Server 2012 R2, see What's New in DNS Server. These updates do not affect the procedures in this guide. The product disc or other installation media for Windows 8. Two computers that meet the minimum hardware requirements for Windows Server 2012 and Windows 8. Configure DC1: DC1 is a domain controller and Active Directory-integrated authoritative DNS server. Configure DNS1: DNS1 is a non-authoritative, caching DNS server. Configure DC2: DC2 is a secondary domain controller and Active Directory-integrated DNS server. Configure Client1: Group Policy settings for DNS are applied to Client1 and it is used to issue DNS client queries. A DNSSEC Key Master for the contoso.com DNS zone. Additional tasks will be performed on DC1 during the demonstration portion of the test lab, including NRPT configuration, DNSSEC zone signing, distribution of trust anchors, and demonstration of DNSSEC key rollover. Click the Notification flag and then click Promote this server to a domain controller. Next, a domain administrator account must be created to use when performing procedures in the test lab. Next, configure a new DNS zone: sec.contoso.com. This zone will be used to demonstrate DNSSEC zone signing. The domain zone (contoso.com) can also be signed with DNSSEC. However, the test lab includes validation failure scenarios that add complexity if the domain zone is signed. On the Server Manager menu, click Tools, and then click DNS. In the DNS Manager console tree, right-click Forward Lookup Zones and then click New Zone. In the New Zone Wizard, click Next three times, and then under Zone name type sec.contoso.com. Verify that the zone “sec.contoso.com” is displayed under Forward Lookup Zones. Next, add one or more DNS resource records to the sec.contoso.com zone. Leave the DNS Manager console open. Right-click sec.contoso.com and then click New Host (A or AAAA). In the New Host dialog box, type dc1 under Name, type 10.0.0.1 under IP address, and then click Add Host. The IP address of dc1.contoso.com is used here to help demonstrate DNSSEC success and failure scenarios. Confirm that The host record dc1.sec.contoso.com was successfully added is displayed, and then click OK.
Add additional resource records to the zone if desired, and then click Done. DC1 will be used to demonstrate functionality of a network application in an environment with DNSSEC. In the Server Manager navigation pane, click Local Server. Click the word Disabled next to Remote Desktop. In the System Properties dialog box, on the Remote tab, click Allow connections from computers running any version of Remote Desktop (less secure), and then click OK.
A non-authoritative, recursive DNS server. A DNS client computer (optional: If Client1 is not used). During the demonstration portion of the test lab, DNS1 will be used to perform recursive DNS queries, host a trust anchor for the contoso.com domain, and provide DNSSEC validation for DNS client queries. Optionally (if a separate DNS client computer is not used), DNS1 will be used to issue DNS client queries. The procedure below is identical to the steps used to install the operating system and configure TCP/IP on DC1, with the exception that DNS1 is configured with an IP address of 10.0.0.2. DNS1 is a domain member server running the DNS Server role service. DNS1 is not a domain controller. In the Server Manager Dashboard navigation pane, click Configure this local server. On the Computer Name tab, click Change and then type DNS1 under Computer name. When you are prompted to provide credentials to join the domain, enter the credentials for the user1 account that was created previously. Confirm that computer name and domain changes were successful, click OK, and then click Close. In the Add Roles and Features Wizard, click Next three times, and then on the Select server roles page select the DNS Server checkbox. Wait for the installation process to complete, verify on the Installation progress page that Installation succeeded on DNS1.contoso.com is displayed, and then click Close. On the Server Manager menu bar, click Tools and then click DNS. In the DNS Manager console tree, right-click DNS1 and then click Properties. Click the Forwarders tab, click Edit, type 10.0.0.1, and then click OK twice. Network Monitor will be used to view detailed information about DNS queries. Installation of Network Monitor is optional in the test lab. Results of network traffic analysis using Network Monitor are provided in the Appendix: Network Monitor results section. Download the latest version of Network Monitor from the Microsoft Download Center: Network Monitor 3.4 (http://go.microsoft.com/fwlink/p/?LinkId=103158). Double-click the installation file, click Yes when prompted to continue, click Next, read and accept the license agreement, and then click Next. Choose Use Microsoft Update when I check for updates (recommended) and then click Next. Choose the Complete installation type, and then click Install. Click Finish and click Yes in the User Account Control dialog box. A secondary domain controller for the contoso.com Active Directory domain. Installing and configuring DC2 is recommended but optional. DC2 is required to perform some, but not all, steps in the test lab. If you must limit the number of computers used in the test lab, skip the steps for installing and configuring DC2. DC2 is required for demonstration of Active Directory replication and transferring the Key Master role from DC1 to DC2. During the demonstration portion of the test lab, DC2 will be used to demonstrate Active Directory replication of a DNSSEC signed zone, and how to transfer the Key Master role on DC1 to another authoritative DNS server. The procedure below is identical to the steps used to install the operating system and configure TCP/IP on DC1, with the exception that DC2 is configured with an IP address of 10.0.0.3. Next to IP address type 10.0.0.3 and next to Subnet mask type 255.255.255.0. It is not necessary to provide an entry next to Default gateway. 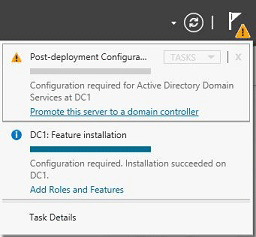 The steps to install Active Directory and DNS on DC2 are nearly the same as those for DC1. All steps are provided below for completeness. The Server Manager Dashboard navigation pane, click Configure this local server. On the Computer Name tab, click Change and then type DC2 under Computer name. When you are prompted to provide credentials to join the domain, enter the credentials for the user1 account. Wait for the installation process to complete, verify on the Installation progress page that Configuration required. Installation succeeded on DC2.contoso.com is displayed, and then click Close. In Server Manager, click the Notification flag and then click Promote this server to a domain controller. In the Active Directory Domain Services Configuration Wizard, on the Deployment Configuration page, choose Add a domain controller to an existing domain, confirm that the name displayed next to Domain is contoso.com, supply credentials for the CONTOSO\user1 account, and then click Next. On the Domain Controller Options page, select the Domain Name System (DNS) server and Global Catalog (GC) checkboxes, type the Directory Services Restore Mode (DSRM) password next to Password and Confirm password, click Next five times, and then click Install. Confirm that installation was successful. The computer will restart automatically. After the computer has restarted, sign in with the CONTOSO\user1 credentials. During the demonstration portion of the test lab, Client1 will receive NRPT settings from Group Policy and be used to perform DNS queries. On the Start page, type ncpa.cpl, and then press ENTER. The Network Connections control panel will open. Next to IP address type 10.0.0.4 and next to Subnet mask type 255.255.255.0. It is not necessary to provide an entry next to Default gateway. Next to Preferred DNS server, type 10.0.0.2. The DNS client computer should use a non-authoritative DNS server for this test lab. The IP address used for Preferred DNS server should correspond to DNS1 (10.0.0.2), not a DNS server running on a domain controller (DC1 or DC2). In order for Client1 to receive domain Group Policy settings, it must be joined to the contoso.com domain. When you are prompted to enter an account with permission to join the domain, provide the credentials for the CONTOSO\user1 account, and then click OK. 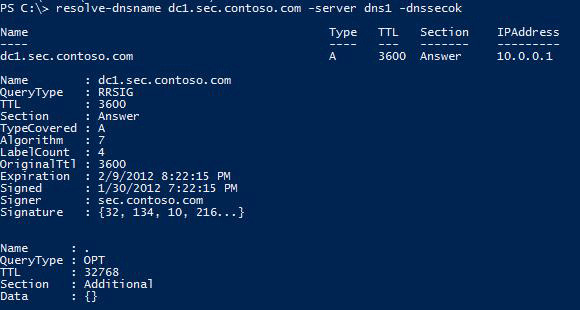 The DNSSEC demonstration on Client1 makes use of Windows PowerShell to query DNS servers. To make Windows PowerShell more easily accessible, it will be pinned to the taskbar. On the Start page, type powershell, right-click Windows PowerShell, and then click Pin to taskbar. Press the ESC key to return to the desktop. Confirm that Windows PowerShell is pinned to the taskbar. For the DNSSEC demonstration portion of the test lab, you can use DNS1 instead of Client1 to perform DNS client queries if the Client1 computer is not available. If the DC2 computer is not available, you must skip some of the procedures below. Query an unsigned zone without DNSSEC validation required. Query a signed zone with DNSSEC validation required. Unsign the zone and then re-sign the zone with custom parameters. Demonstrate Active Directory replication of DNSSEC signed resource records. First, use the resolve-dnsname cmdlet to query an unsigned zone when validation is not required. On Client1, click Windows PowerShell on the taskbar, type cd\ and press ENTER. Start a Network Monitor capture if desired. Stop the capture after issuing the following command, and then save the capture using the name: Capture1. The dnssecok option in the command above tells the DNS server the client understands DNSSEC and the server can send these additional records. Since the zone is not yet signed, no signature (RRSIG) records are displayed in the response. Leave the Windows PowerShell prompt open for the following procedures. Enter the password for the user1 account and click OK. When you are prompted that there is a problem with security of the remote computer, click Yes. Verify that you are able to successfully connect to dc1.sec.contoso.com, and then close the remote session. Next, sign the sec.contoso.com zone and distribute a trust anchor for the zone. Trust anchor distribution is manual for DNS servers that are not running on domain controllers, such as DNS1. Automatic trust anchor distribution can be enabled for Active Directory-integrated DNS servers such as DC2. In the DNS Manager console tree on DC1, navigate to Forward Lookup Zones > sec.contoso.com. Right-click sec.contoso.com, point to DNSSEC, and then click Sign the Zone. In the Zone Signing Wizard, click Next, and then choose Use recommended settings to sign the zone. Click Next twice, confirm that The zone has been successfully signed is displayed, and then click Finish. Refresh the DNS Manager console and verify that a new icon is displayed for the sec.contoso.com zone, indicating that it is currently signed with DNSSEC. Click the sec.contoso.com zone and review the new resource records that are present, including DNSKEY, RRSIG and NSEC3 records. On DC1, click Windows Explorer on the taskbar. 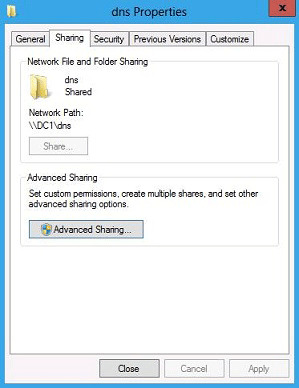 Navigate to C:\Windows\System32, right-click the dns folder, point to Share with, and then click Advanced sharing. In the dns Properties dialog box, click Advanced Sharing, select the Share this folder checkbox, verify the Share name is dns, and then click OK.
Click Close and then close Windows Explorer. On DNS1, in the DNS Manager console tree, navigate to the Trust Points folder. Right-click Trust Points, point to Import, and then click DNSKEY. In the Import DNSKEY dialog box, type \\dc1\dns\keyset-sec.contoso.com and then click OK. In the console tree, navigate to Trust Points > com > contsoso > sec and verify that import was successful. Two DNSKEY trust points are displayed, one for the active key and one for the standby key. Verify that two trust anchors are displayed. On DNS1, right-click Windows PowerShell and then click Run as Administrator. Verify that “Failed to enumerate the trust anchors” is displayed. The trustanchors zone is deleted using the remove-dnsserverzone cmdlet so that the add-dnsserverprimaryzone cmdlet can be demonstrated. It is not typically required to remove and restore the trustanchors zone after deleting trust anchors. Verify that two trust anchors are again displayed. On DC1, in the DNS Manager console tree, navigate to Forward Lookup Zones > sec.contoso.com. Right click sec.contoso.com, point to DNSSEC, and then click Properties. Click the Trust Anchor tab. Select the Enable the distribution of trust anchors for this zone checkbox, and then click OK. When you are prompted to confirm changes to the zone, click Yes. When you are prompted that configuration was successful, click OK.
On DC2, refresh the view in DNS Manager and confirm that trust anchors for sec.contoso.com are present. You might need to wait a few minutes for replication to occur on DC2. Additional DNSSEC related information is displayed for signed resource records. Compare query results for dc1.contoso.com to query results for dc1.sec.contoso.com if desired. Start a Network Monitor capture if desired. Stop the capture after issuing the following command, and then save the capture using the name: Capture2. Confirm that no NRPT policy for the sec.contoso.com namespace is currently applied to the client computer. Leave the Windows PowerShell prompt open. The Name Resolution Policy Table (NRPT) is used to require DNSSEC validation. The NRPT can be configured in local Group Policy for a single computer, or domain Group Policy for some or all computers in the domain. The following procedure uses domain Group Policy. On DC1, on the Server Manager menu bar, click Tools, and then click Group Policy Management. In the Group Policy Management console tree, under Domains > contoso.com > Group Policy Objects, right-click Default Domain Policy, and then click Edit. In the Group Policy Management Editor console tree, navigate to Computer Configuration > Policies > Windows Settings > Name Resolution Policy. In the details pane, under Create Rules and To which part of the namespace does this rule apply, choose Suffix from the drop-down list and type sec.contoso.com next to Suffix. On the DNSSEC tab, select the Enable DNSSEC in this rule checkbox and then under Validation select the Require DNS clients to check that name and address data has been validated by the DNS server checkbox. In the bottom right corner, click Create and then verify that a rule for sec.contoso.com was added under Name Resolution Policy Table. Click Apply, and then close the Group Policy Management Editor. Verify that computer and user policy updates were successful, and that the value of DnsSecValidationRequired is True for the .sec.contoso.com namespace. 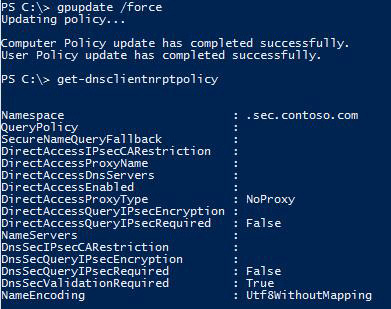 Repeat the Group Policy update (gpupdate /force) and verify NRPT policy on client1. Start a Network Monitor capture if desired. Stop the capture after issuing the following command, and then save the capture using the name: Capture3. Confirm that the same results are returned as previously before validation was required. Because a valid trust anchor is present on DNS1, the query is successful even if validation is required. Before unsigning and re-signing the zone, issue some queries for DNSSEC records. These types of queries can be useful when troubleshooting DNSSEC. To see the syntax for resolve-dnsname, including all possible values for the Type parameter, type get-help resolve-dnsname. DNSSEC signing will be removed from the sec.contoso.com zone and then the zone will be re-signed using custom DNSSEC parameters. Right-click sec.contoso.com, point to DNSSEC, and then click Unsign the Zone. In the Unsign zone wizard, click Next. Verify that The zone has been successfully unsigned is displayed, and then click Finish. Refresh the view in DNS Manager and verify that the sec.contoso.com zone no longer contains DNSSEC signed records, and the icon next to the zone indicates it is not currently signed. On DC1, right-click sec.contoso.com, point to DNSSEC, and then click Sign the Zone. In the Zone Signing Wizard, click Next. 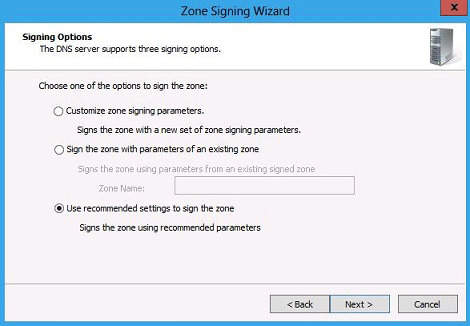 Customize zone signing parameters is chosen by default. Click Next. 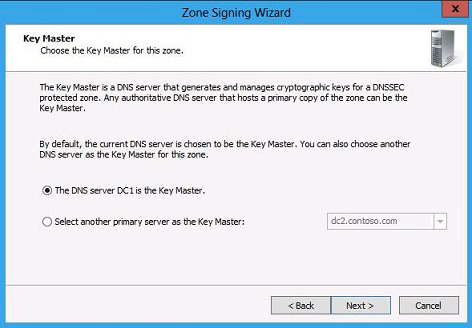 On the Key Master page, The DNS server DC1 is the Key Master is chosen by default, because zone signing is being performed on DC1. If you have configured DC2 in this test lab, review options available when Select another primary server as the Key Master is chosen. Do not choose this option, but verify that dc2.contoso.com is also available as a possible Key Master for this zone. When you are alerted that all authoritative servers capable of DNSSEC online signing will be loaded, click Yes. Ensure that DC1 is chosen as the Key Master and then click Next twice. On the Key Signing Key (KSK), page, click the existing KSK (with key length of 2048), and then click Remove. To add a new KSK, click Add. In the New Key Signing Key (KSK) dialog box, under Key Properties, click the drop-down next to Cryptographic algorithm and select RSA/SHA-512. Under Key Properties, click the drop-down next to Key length (Bits) and select 4096 and then click OK.
Click Next until You have successfully configured the following parameters to sign the zone is displayed. Review the parameters you have chosen and then click Next to start the zone signing process. Confirm that The zone has been successfully signed is displayed, click Finish, and then refresh the view in DNS Manager to verify the zone is signed again. Refresh the view for the Trust Points folder and verify that new DNSKEY trust points are present that use the RSA/SHA-512 algorithm. Note that DC1 and DC2 are using the new trust anchors, but DNS1 has the old trust anchors. You might need to wait a few minutes for automatic distribution of the new trust anchors to DC2. Because the trust anchor that was distributed to DNS1 is no longer valid, DNSSEC validation will fail when resource records are queried in the sec.contoso.com zone. On DNS1, view the currently installed Trust Points for sec.contoso.com and verify that the old trust anchor that uses the RSA/SHA-1 algorithm is present. 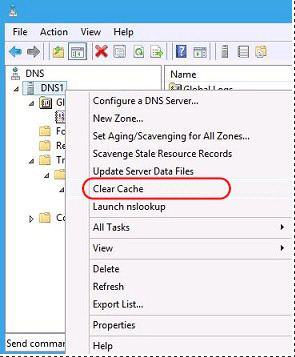 To flush the DNS server cache, right-click DNS1 and then click Clear Cache. Start a Network Monitor capture if desired. Stop the capture after issuing the following command, and then save the capture using the name: Capture4. Start a Network Monitor capture if desired. Stop the capture after issuing the following command, and then save the capture using the name: Capture5. Because DNSSEC validation fails, you cannot connect to dc1.sec.contoso.com using Remote Desktop. Verify that Remote Desktop can’t find the computer “dc1.sec.contoso.com” is displayed. When DNS servers are Active Directory-integrated, trust anchors and signed resource records are updated automatically even if the zone is unsigned and re-signed manually. 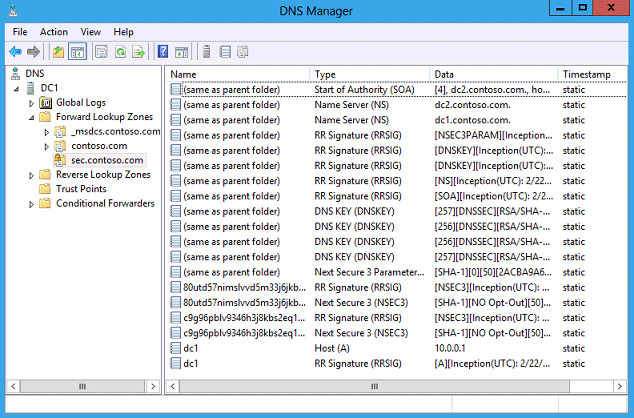 On DC2, in DNS Manager, view the contents of the Trust Points folder. Refresh the view if necessary to view the current trust anchors. Verify that the DNSKEY trust anchors for sec.contoso.com are automatically updated to use the RSA/SHA-512 algorithm. 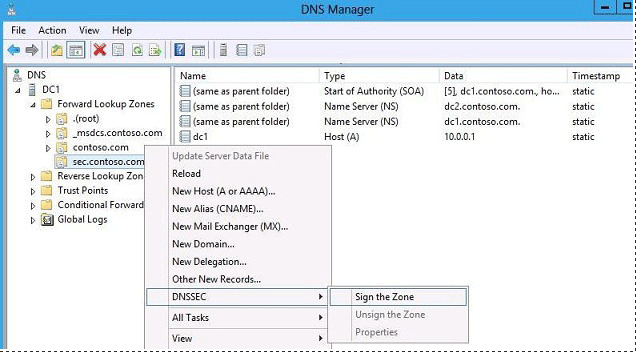 In the DNS Manager console tree, click Global Logs > DNS Events and review event ID 7653 which states that the DNS server has detected that zone signing parameters for the zone sec.contoso.com have been changed and the zone will be re-signed. No event is displayed after zone signing is completed. Click Forward Lookup Zones > sec.contoso.com in the console tree and verify that Secure Entry Point DNSKEY records are present that use the RSA/SHA-512 algorithm. On DC1, in DNS Manager, add a new host (A) record for dns1.sec.contoso.com with an IP address of 10.0.0.2. 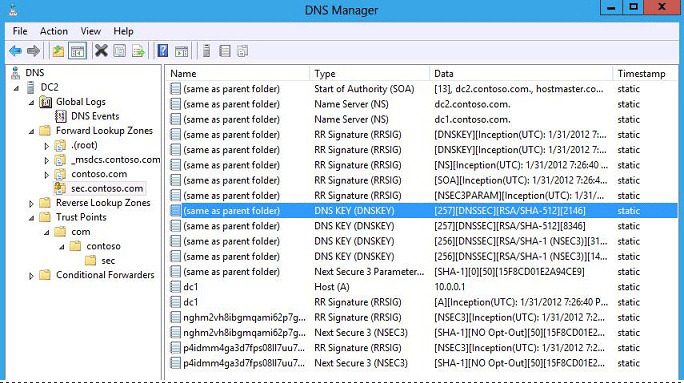 Refresh the view in DNS Manager and verify that an RR Signature (RRSIG) record for dns1 is automatically created. On DC2, refresh the view in DNS Manager and verify that the new signed record has replicated to this server. Adding or editing existing records in a zone does not trigger zone re-signing. Only the new or updated resource records are signed with the updated start of authority (SOA) record for the zone. If might be necessary to transfer the Key Master role for a zone to another DNS server. The role transfer can be performed from any authoritative DNS server, and the current Key Master can be online or offline. In the following example, the current Key Master is online. On DC1 or DC2, in DNS Manager, right-click the sec.contoso.com zone, point to DNSSEC, and then click Properties. On the Key Master tab, select Use the following DNS server as the Key Master. Click the drop-down list and when you are alerted that all authoritative DNS servers will be loaded, click Yes. Choose dc2.contoso.com from the list and then click OK. When you are alerted that the Key Master setting will be changed, click Yes. Verify that Key Master for the zone sec.contoso.com is updated successfully is displayed. Verify that DNS event ID 7649 is displayed on the new Key Master and DNS event ID 7648 is displayed on the previous Key Master. The following sections provide information about the results of Network Monitor (netmon) captures during the DNSSEC demonstration portion of the test lab. Analysis of network traffic uses the Network Conversations, Frame Summary, and Frame Details views. 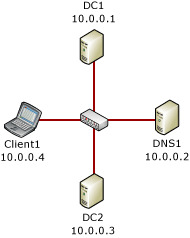 10.0.0.4 – 10.0.0.2: A packet exchange between Client1 (10.0.0.4) and DNS1 (10.0.0.2). Locate the query for the host (A) record for dc1.sec.contoso.com. There are two phases under Frame Summary, one with a source of Client1 and one with a source of DNS1. Locate the packets with the source of DNS1 (with destination = Client1). In Frame Details, under Dns\Flags, the AuthenticatedData (AD) flag will be on (“1”) or off (“0”) depending on whether or not information that was returned was validated as authentic. In Frame Details, under Dns\Flags\ARecord, RRSIG data is returned when the zone is signed as long as the value of Rcode under Dns\Flags is Success. 10.0.0.2 – 10.0.0.1: A packet exchange between DNS1 (10.0.0.2) and DC1 (10.0.0.1). In Frame Details, under Dns\Flags\ARecord, DNS1 issues a query for sec.contoso.com of type DNSKEY when a trust anchor is present on DNS1.